Well done to the three Ivanhoe Harriers relay teams that competed at the State Relay Championships on Saturday, 29th November, 2014 at Lakeside Stadium, Albert Park. Wow! what a night, the buzz of excitement and conversation hit you as you approached the entry foyer, hastening your feet inside. 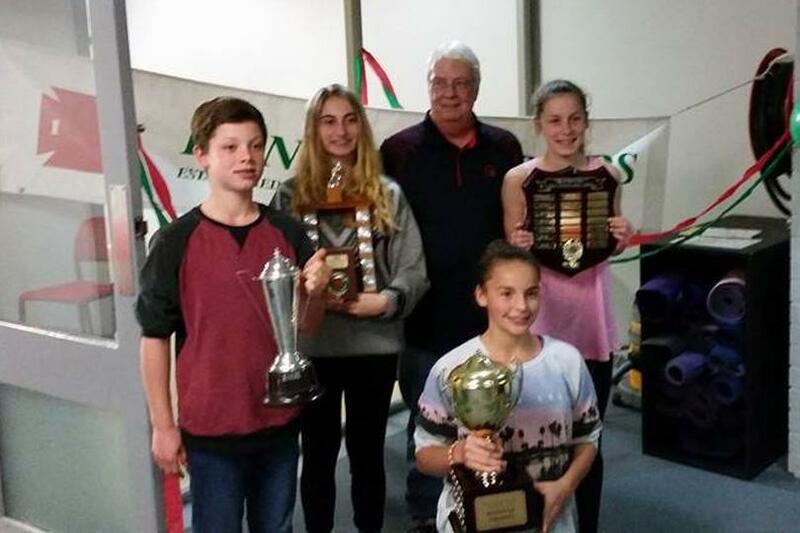 This fantastic event was held at the Streeton Room in The Ivanhoe Centre, (the former Lower Heidelberg Town Hall), greeted by the continuous screening of the many Ivanhoe athletes striving to do their best. Two-hundred and ten past and present members, descendants and families, were joined by the sponsors at this gala event. Vicar of St James Church Stephen May and representing Ivanhoe Grammar School Chris Branigan, rounded off the connections for the formation of the club. Banyule Mayor Cr Craig Langdon popped in to add the council's congratulations in the form of a certificate, while local MP Anthony Carbines was welcomed as a guest. The meet and greet time, prior to the dinner, was absolutely alive with happy reunions, handshakes for everyone, a few lucky ones even scored a kiss and hug from some of the ladies. Old timers who had not seen each other for over 50 years dredged up memories and stories of heroics in days gone by; meanwhile younger members marveled at the fact all these grey-haired guys were once very keen athletes. The nametags everyone wore came in very handy as, unfortunately some might say, appearances do change with age. The ceremonies of the evening kicked off with a brief introduction from Jeff Franklin, welcoming everyone with a special thank you to sponsors Stuart Oldmeadow of Miles Real Estate, Michael Wallis representing Blue Rock Law and Windsor Income Protection, plus a warm welcome to descendants of former club greats, Mary Osborn (Jack Osborn) and Margaret Picken (Ron Mill). Jeff then introduced current club president, John David, who warmly welcomed everyone. “It is fantastic to see we have over 200 people here this evening with most of our life members present, or represented by their families. Tonight is an opportunity to celebrate this major milestone for our club,” said the president. John went on to thank the sub-committee who has worked tirelessly to make this event the success it obviously is, the multitude of tasks undertaken having culminated in the smooth running of the evening. A round of applause for the sub-committee greeted these comments before the president gave a brief outline of the current status of the club with encouragement to everyone to support an increase in club membership. John concluded with an appeal for past members who may still have an itch to compete to contact the club with an expression of interest and, if they don't feel up to it, encourage their children or even grand children to come along and see what it's all about. Interspersed with the three-course dinner, the Ivanhoe Harriers "Team of the Century" was announced with certificates presented to those in attendance. Pictured below are some of the team members present on the night. The women's and men's teams can be found in the great 100-year history book ‘From St James Church to Willinda Park’ that was launched during the evening. This publication would not have been possible without the support of the sponsors. Anyone who has not purchased a copy is missing a great read, as not only is the history of the club traced throughout the century, it covers every aspect of the club, records, Olympians and premierships, interesting anecdotes, including a huge number of action photographs, some of which have not been seen before. Later in the evening, that stalwart of the club and esteemed coach John Boas, had the privilege of inducting Ian Campbell as a Life Member, joining the ranks of 26 other noteworthy Ivanhoe veterans. Ian's acknowledgement speech attributed the great help both John and the club had been over many years to enable him to become world renowned in the triple jump. In total, Ian's speech was quite inspirational and highlighted the many benefits members gain, not just athletically but in personal development, by becoming involved in this great club. In wrapping up the event, everyone certainly left with a smile on their face, the evening adding another fond memory for the past members who were heard determining that the gap until next time they get together won't be as long. For the 2014/15 summer season AV Shield will now only include 10 rounds of competition plus an AV Shield Final. Athletics Victoria have also introduced a Zone vs. Zone competition within the new AV Shield structure. Meaning that 3 rounds of AV Shield will also be Zone vs. Zone competition and there will be a separate Zone Final for the top four of the seven zones. Also introduced is a new graded competition called AV Knockout that is based on AV rankings and will replace the sanctioned specialist group meets of last season. The top 60 ranked athletes for each event will be offered participation in the first round. The top 32 will progress to the following round and ultimately the top 16 ranked athletes in each event will compete in the AV Knockout Final. The newspaper article currently online will hopefully appear in the next issue of the Heidelberg Leader and Diamond Valley Leader newspapers. This year is the centenary of our great club, a significant milestone, which we will be celebrating with a dinner on 11th October 2014 at The Centre Ivanhoe (formerly City of Heidelberg Town Hall) Upper Heidelberg Road, Ivanhoe. The club has been able to secure a discounted price of $85 per head for this special occasion which is inclusive of a 3 course meal and drinks. You can download a formal invitation and order form for this celebration. We sincerely hope that you join us on this special occasion. On the night our Team of the Century will be announced and a book celebrating the club's history “From St James Church to Willinda Park” will be launched. The 300 page book - compiled by life member Andrew Edney is fantastic value at $30 per copy and a must read for all those who have been associated with the club. The book will only be available for collection on the night. Commencing from 6.00pm, the evening provides opportunity to meet and greet old friends both prior to and after the formal dinner which commences at 7.30pm. Early booking and payment is essential to secure your place, with numbers attending and payment needing to be finalised by September 5th. If you know of any former team mates who may not have been notified then please forward an invitation to them. St. James's harriers (now Ivanhoe Harriers) combined with Melburnian hare and hounds at Brighton Beach on Saturday, 25 July 1914, and had a very pretty run over 6 miles of very level country. The harriers started from the baths, and followed the trail over barbed wire fences, and through Chinese gardens, in the direction of Sandringham. About 1000 yards from home the runners were lined up on the Brighton Beach road, and a run-in was held, the order of finishing being F. Bryant, C. Taylor, L. Everitt. The plunge in the baths was very enjoyable, but, as will be imagined, did not last long. For those who don't know, we understand CURSUS comes from the latin “to run” and there will be more about it's beginning and how it was produced in the early days inside the club Centenary Book that will be released at the centenary celebrations. It is fantastic to see this valued communication tool re-introduced for not only does it keep you informed on all happenings with the “HOE”, it is also recording history and it is from past print and e-mail editions that a great deal of information has been gleaned for the Centenary Book. Click here for the first edition prepared by David Illingworth and helpers. ENJOY! For those that don’t know, this year is the centenary of our great club, something to really look forward to and enjoy. Many of you had previously been given a date but due to a venue glitch the date has changed so please take note and correct your calendar. This will be a day not to be missed so reserve the date! TIME Yet to be announced as details are still being worked on by the organising committee. Social mingle time, catch up with friends. Release of the book covering 100 years of the club. Announcement of the Team of the Century. From a huge amount of painstaking work Andrew Edney has compiled a very comprehensive 100 year history book that traces the highs and lows, the stars and the stalwarts, a fascinating read. The Team of the Century has been a much worked over exercise by an experienced dedicated group and the result provides a fitting tribute to our athletes. More information on the function etc. in the near future. Round 3 - Brimbank Park Cross Country - Results and Photos. Congratulations to our junior trophy winners and the Men's Division 2 Red Zone Premiership team. A successful year for Ivanhoe Harriers. Round 1 - Jells Park Cross Country Relay was held at Jells Park on Saturday, this time running in the opposite direction to previous years. Photos. Please RSVP your attendance to John David by Monday the 12th May 2014. Cost: $10 per person, $25 for families of 3 or more. Light party food will be provided - BYO drinks. The AV Shield Final was held on 12th Aprril at Albert Park. After a closely fought battle all day for third place the Men's Open Division 2 team eventually finishing fifth. The Cross Country calendar has been released for season 2014. Congratulations to Ivanhoe Harriers life member Gary Honey who was recently inducted into the Athletics Australia Hall of Fame. You can read the Athletics Australia article for the details of his outstanding athletics career. Round 12, the last round, was held on Thursday, 27th March at Meadowglen Athletics Stadium, Epping. Results and final Ladder. The Open Men's Division 2 team finished on top of the ladder and therefore progress to the AV Shield Final to be held at Albert Park on 12th April. This year sees the 100th Anniversary of the Ivanhoe Harriers Athletic Club. A celebration will be held at Willinda Park on Sunday the 19th October 2014 from 11am to 4pm. More details to follow as we get closer to the event. Congratulations to Glen Nicholson for winning the Bronze medal in the Long Jump at the Victorian Open T&F Championships on the weekend. Well done to Tim in the Pole Vault also. It was like old times at the Victorian Junior Championships. Ivanhoe Athletes won four gold, three silver and two bronze medals and set numerous personal bests, and two club records. We dominated the under 14 division, and it was so good to see the Ivanhoe uniform figuring prominently on the track and in the field. Rhys Rigoni won the under 14 pole vault, discus throw and javelin throw, and claimed silver in the shot put to be the outstanding male under 14 athlete in the championships. It is even more remarkable given that he has been injured, and this competition was the first he was able to complete almost pain free for nearly 12 months. The under 14 women’s pole vault resulted in a trifecta for Ivanhoe. Beth Illingworth was first, Grace Dicker second, and Kyla Green third. (Although competing for South Coast, she is a registered second claim member for Ivanhoe). Beth Illingworth went on to gain a complete set of medals, winning silver in the 200m hurdles and bronze in the 80m hurdles, where her time of 13.57 was a new club record. She also made the final of the 100m where she finished 8th. She set PBs in each of her events. Grace Dicker started her week-end with the 400m. In the heat she clocked 1:05.13, a huge PB and a new club record. She later finished 5th in the final. She also made the finals of the 100m, setting a PB in the heat, and also the final where she finished 9th, and the 200m where her huge programme caught up with her, and she came in 8th, after a promising heat. While not qualifying for the finals, Abi Adams ran PBs in the under 15 100m and 200m, which is all that can be asked of athletes in championships. Flynn Dicker has only been doing pole vault for just over a month, but in the under 16 event, he finished 4th with a national qualifying performance, a tremendous achievement. Hopefully the club can build on these performances and return to the position we held in the past, as the premier junior club in the State. Due to the forecast high temperature this Saturday, 8th February, Round 9 of AV Shield has been called off.